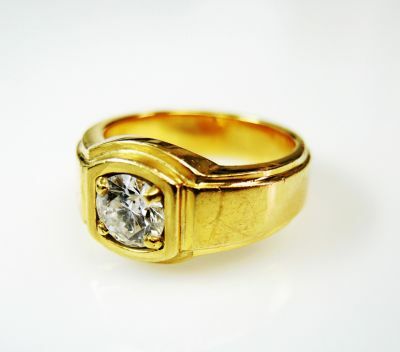 A wonderful Art Deco inspired 18kt yellow gold ring with 1 round brilliant cut diamond, est. 0.90ct (clarity:SI1 & F colour). The diamond is accompanied by a GIA Diamond Dossier numbered 1106753394 and the is engraved on the girdle with GIA 1106753394. Please make an appointment to see this diamond ring.